We can able to keep our Web pages keep away from Unnecessary things such Comments, Un closed Tags, Un closed End Tags using HTML Tidy Object from PHP. Here is the Example Code for PHP tidy Object. with Examples. 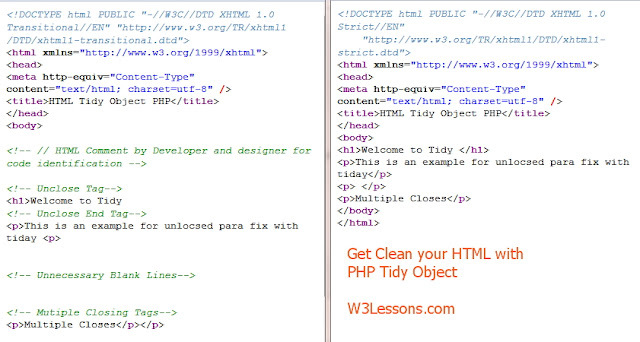 With this Example We have to use tidy Object (Tidy Object need to Enabled in PHP Configuration). This is really helpful to me for understanding the web page loading with user perspective. Thanks! for this code, Nizzzzzz.. Likewise, the single quote will further enable programmers to print longer lines of information more efficiently. However, the developers have to make changes to the PHP code while using single quotes instead of double quotes.